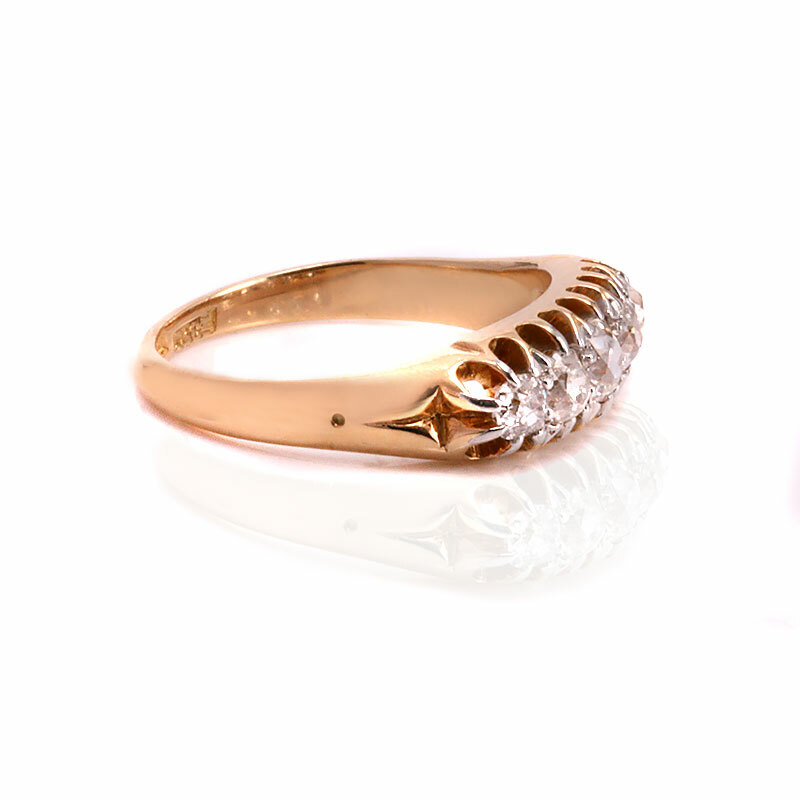 Product code: ES7811 Categories: Antique, Antique Engagement Rings, Antique Rings. Sitting perfectly on the finger, this 18ct antique mine cut diamond engagement ring dates from the late Victorian period of the 1880’s and is just so elegant and traditional. The antique mine cut diamonds are also known as “cushion cut diamonds” thanks to there somewhat resemblance in shape to a cushion and were first cut at the start of the 18th Century and remained the main cut of diamonds for over a century. Set with five mine cut diamonds, the diamonds come together to total 0.96 carats and graduate so elegantly in size from the end diamonds to the centre diamond. 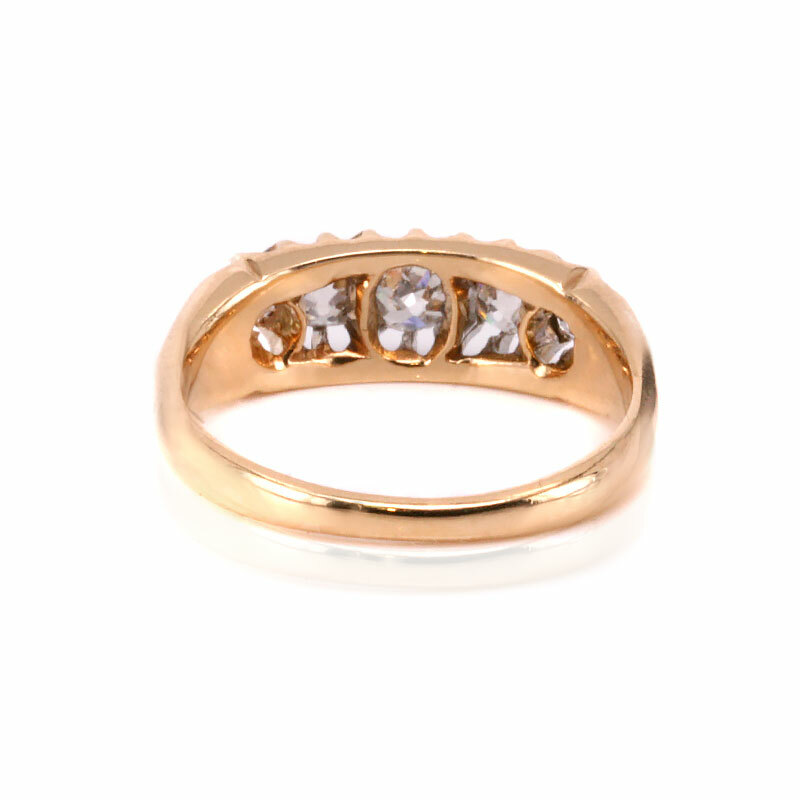 With lovely claw work that not only holds the diamonds securely but also allows so much light to enter throughout each diamond, this ring has a wonderful amount of sparkle coming from the old world charm of these lovely antique cut diamonds. Measuring 6.2mm wide in the centre by 17.5mm across from one end diamond to the other, this antique diamond engagement ring will certainly always be loved and admired. Tag: 18ct antique diamond engagement ring. 18ct antique mine cut diamond engagement ring. At the start of the 18th century, a great leap forward emerged with the “invention” of the new 58-facetted diamond. At the time, these were the closest resemblance to today’s brilliant cut, and are referred to as old mine cuts, or old miners. These were cut often squarish or cushion shaped, with quite a steep angle on the crown and pavilion, to maximise weight retention. While weight was kept to a maximum, they often lacked a lot of internal fire and “brilliance”. As well as these features, the “old miners” often had quite a large culet or “collet”, the horizontal base formed by the blunting of a point when the stone is cut as a brilliant. Images of the old mine cut diamonds. This antique diamond engagement ring is set with mine cut diamonds that total nearly one carat in weight.